When your installation doesn’t call for permanent placement of aluminum bleachers, it just makes sense to opt for the ultimate in flexibility. Transportable bleachers enable you to configure outdoor and indoor special events areas the way you want them every time you have an event. By not locking you into a set configuration, these bleachers enable you to create the best possible seating arrangement for each event as it arises. Plus, portable designs can be used indoors or out as required. At SightlinesBleachers.com, we offer you access to a wide selection of portable indoor and outdoor bleachers. We are a Kentucky-based company that has more than 30 years of experience to our credit. Our customers can count on us to deliver exceptional products, fantastic service and highly competitive pricing. We are committed to only offering IBC Code compliant aluminum bleachers and other designs. Five-row, 42-seat designs – These transportable aluminum bleachers are designed to comfortably hold up to 42 spectators. The design of this style of bleachers includes security fencing for safety of spectators. A transport kit is required to offer the ultimate in portability with this design. Five-row, 54-seat models – These outdoor bleachers are perfect for occasions that call for a little more seating. This design does require a transport kit, which is sold separately. Five-row, 74-seat designs – This model is perfect for larger needs and is fully IBC Code compliant. With security fencing around the elevated rows, customers can count on spectator comfort and safety. Transport kits are required to make portability easier. Ten-row, 82-seat models – These aluminum bleachers are great for larger scale needs where portability is still required. Coming in at 15 feet in length, the design will comfortably hold up to 82 people. A bleacher transport kit is required to go along with this design. Ten-row, 104-seat designs – For larger seating requirements, this model offers a great choice. These aluminum bleachers comfortably seat up to 104 people and still provide portability. A transport kit is needed to move this 2,350-pound installation. Ten-row, 144-seat – This design is our largest available. It holds up to 144 people with ease and meets all IBC Codes for safety. 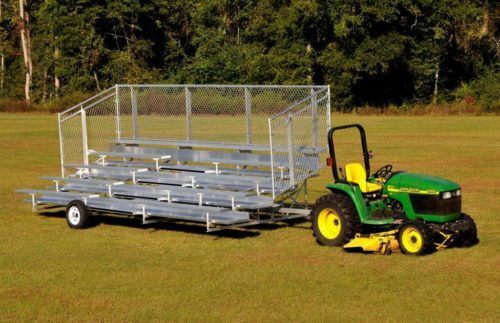 A transport kit makes moving these outdoor bleachers easy. If you need aluminum bleachers that deliver large seating capacities while still offering portability, we have the solutions you seek. 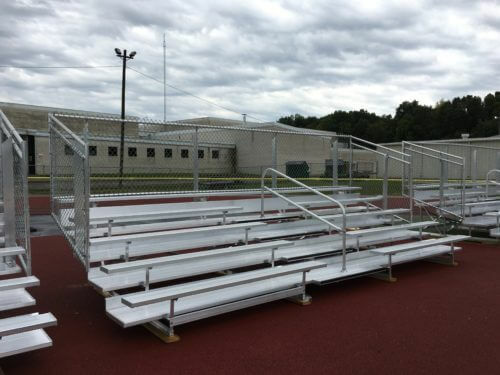 Just take a look at our transportable outdoor bleachers to find the model that best suits your needs. If you’re ready to order, you can do so right online. Should you have questions about any of our products, including aluminum picnic tables and aluminum benches, just call us directly. You can reach us at 1-800-609-1545. When you need seating or tables for special events, park settings and more, SightlinesBleachers.com is here to serve. 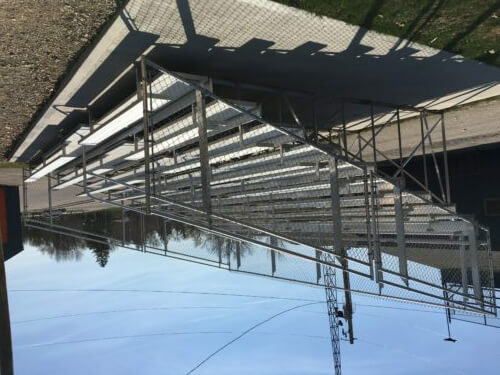 It is our pleasure to provide our customers with a tremendous selection of aluminum bleachers and more at prices that are set to please.